Do Financial Responsibility Scores Predict College Closures? The U.S. Department of Education’s Office of Federal Student Aid quietly released data on the financial responsibility scores of private nonprofit and for-profit colleges earlier this week, something that they have done for each of the last nine years. These scores, which can range from -1.0 to 3.0, are designed to represent a college’s financial health (although some colleges dispute the value of these scores). A score of 1.5 or above represents a passing score, meaning colleges can receive federal financial aid dollars without any additional restrictions. Colleges scoring 0.9 or below fail the financial responsibility test and must submit a letter of credit to the Department of Education and submit to additional oversight in order to receive federal funds, while colleges scoring between 1.0 and 1.4 receive additional oversight but do not have to submit a letter of credit. Colleges in the worst financial shape may not even receive a score, as the Department of Education can instead choose to place a college under heightened cash monitoring rules (similar to the penalties for failing) without even doing the calculations. In the newly-released data for the 2014-15 fiscal year, 187 colleges failed, 139 were in the oversight zone, while 3,048 passed unconditionally. The number of failures is the lowest on record, while the number in the oversight zone is also relatively low compared to past years. But at the same time, the rate of college closures increased sharply last year. Does this mean that financial responsibility scores are identifying financially struggling colleges, or is the metric incorrectly identifying colleges at risk of closure as being financially stable? To answer this question, I used the best existing database of college closures—from Ray Brown’s College History Garden blog. (Check it out!) I examined the fourteen accredited private nonprofit colleges that closed in 2016 to see what the college’s financial responsibility score was in the 2014-15 fiscal year. (For colleges without a score, I checked the heightened cash monitoring (HCM) list as of September 1, 2015.) The results are below. Two of the 14 colleges did not show up as either having a financial responsibility score or being under HCM, while three other colleges were on HCM due to financial issues and did not receive a financial responsibility score. Of the other nine colleges, four received a passing financial responsibility score (the Ohio College of Massotherapy received the same score as Yale), two were in the additional oversight zone, and three failed. This suggests that either financial conditions changed considerably between mid-2015 and 2016 for some colleges or that financial responsibility scores are an imperfect measure of a college’s fiscal health. Author RobertPosted on March 8, 2017 March 8, 2017 Tags accountability, data, financial responsibility2 Comments on Do Financial Responsibility Scores Predict College Closures? Do Financial Responsibility Scores Reflect Colleges’ Financial Strength? In spite of the vast majority of federal government operations being closed on Thursday due to snow (it’s been a rough end to winter in this part of the country), the U.S. Department of Education released financial responsibility scores for private nonprofit and for-profit colleges and universities based on 2012-2013 data. These scores are based on calculations designed to measure a college’s financial strength in three key areas: primary reserve ratio (liquidity), equity ratio (ability to borrow additional funds) and net income (profitability or excess revenue). A college can score between -1 and 3, and colleges that score over 1.5 are considered financially responsible without any qualifications and can access federal funds. Colleges scoring between 1.0 and 1.4 are considered financially responsible and can access federal funds for up to three years, but are subject to additional Department of Education oversight of its financial aid programs. If a college does not improve its score within three years, it will not be considered financially responsible. Colleges scoring 0.9 or below are not considered financially responsible and must submit a letter of credit and be subject to additional oversight to get access to funds. A college can submit a letter of credit equal to 50% of all federal student aid funds received in the prior year and be deemed financially responsible, or it can submit a letter equal to 10% of all funds received and gain access to funds but still not be fully considered financially responsible. As Goldie Blumenstyk (who knows more about the topic than any other journalist) and Joshua Hatch of The Chronicle of Higher Education discover in their snap analysis of the data, 158 private degree-granting colleges (108 nonprofit and 50 for-profit) failed to pass the test in 2012-13, down ten colleges from last year. Looking at all colleges eligible to receive federal financial aid, 192 failed outright in 2012-13 by scoring 0.9 or lower and an additional 128 faced additional oversight by scoring between 1.0 and 1.4. But, as Blumenstyk and Hatch note in their piece, private colleges have repeatedly questioned how financial responsibility scores are determined and whether they are accurate measures of a college’s financial health. I’m working on an article examining whether and how colleges and other stakeholders respond to financial responsibility scores and therefore have a bunch of data at the ready to look at this topic. Thanks to the help of my sharp research assistant Michelle Magno, I have a dataset of 270 private nonprofit colleges with financial responsibility scores and their Moody’s credit ratings in the 2010-11 academic year. (Colleges only have Moody’s ratings if they seek additional capital, which explains the smaller sample size and why few colleges with low financial responsibility scores are included.) 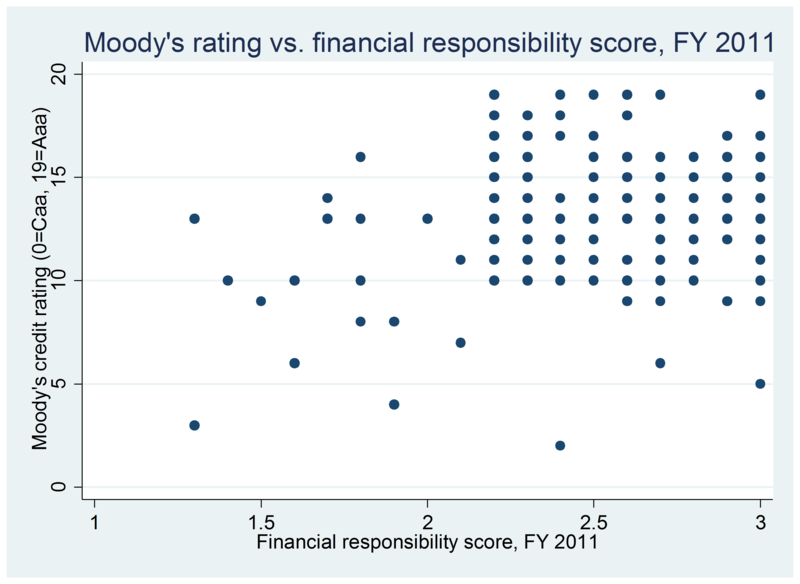 The below scatterplot shows the relationship between Moody’s ratings and financial responsibility scores, with credit ratings observed between Caa and Aaa and financial responsibility scores observed between 1.3 and 3.0. The correlation between the two measures of fiscal health was just 0.038, which is not significantly different from zero. Of the 57 colleges with the maximum financial responsibility score of 3.0, only three colleges (Northwestern, Stanford, and Swarthmore) had the highest possible credit rating of Aaa. Twenty-five colleges with financial responsibility scores of 3.0 had credit ratings of Baa, seven to nine grades lower than Aaa. On the other hand, six of the 15 colleges with Aaa credit ratings (including Harvard and Yale) had financial responsibility scores of 2.2, well below the maximum possible score. This suggests that the federal government and private credit agencies measure colleges’ financial health in different ways—at least among colleges with the ability to access credit. Financial responsibility scores can certainly have the potential to affect how colleges structure their finances, but it is unclear whether they accurately reflect a college’s ability to operate going forward. Author RobertPosted on March 6, 2015 Tags accountability, data, financial responsibility5 Comments on Do Financial Responsibility Scores Reflect Colleges’ Financial Strength?